Rejuvenate your drinking water by storing them in this 100% pure copper bottle. 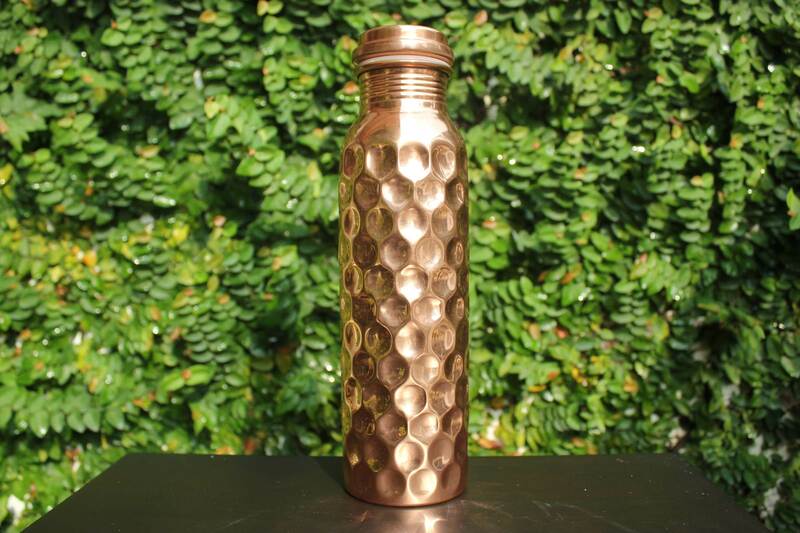 Copper bottles have the ability to alkalize water and infuse them with copper ions, an essential mineral required by the body. 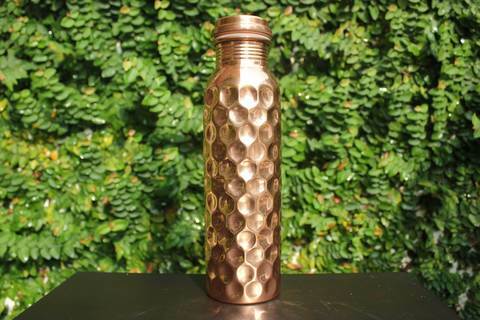 Water stored in copper bottles develops therapeutic benefits and helps maintain the body's pH balance. Make sure you get healthy drinking water, with ease, all the time, anywhere you go! 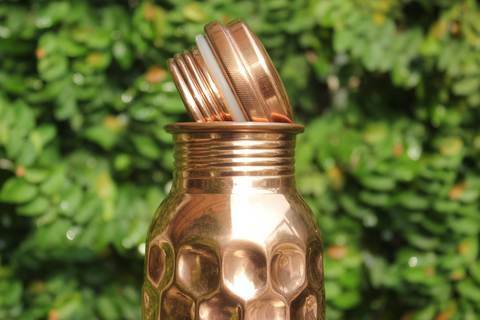 ANTI-MICROBIAL PROPERTIES - copper will eliminate any harmful microorganisms present in the water. It is often referred to as a point-of-use solution for microbial purification of drinking-water. STABLE ALKALINE WATER – in nature, the alkalinity of water is caused by the minerals in it and not by creating excessive OH- ions like conventional water ionizers. Artificially created alkaline water is unstable and not recommended for normal consumption. Water stored in copper bottles absorbs very small amounts of copper. This naturally ionizes the water and causes the water to become natural alkaline water. 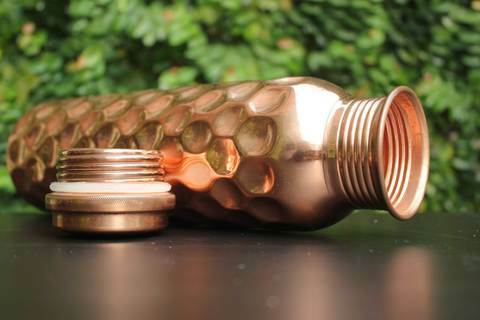 HELPS DIGESTIVE SYSTEM PERFORM BETTER - Water from a copper bottle has properties that stimulate peristalsis (the rhythmic contraction and relaxation of the stomach that helps food get digested and move along the digestive tract), kill harmful bacteria and reduce inflammation within the stomach, making it a great remedy for ulcers, indigestion and infections. WEIGHT LOSS - Water stored in copper bottles also helps your body break down fat and eliminate it more efficiently. HEALS THE THYROID GLAND - Copper is one of the most important trace minerals the thyroid gland needs to function optimally. A lack of copper can send the functioning of the gland out of sync. So when you drink water from a copper vessel. it makes up for this possible deficiency and regulates the functioning of the thyroid gland. PREVENTS ANEMIA - Water infused with copper ions helps in keeping anemia at bay. An essential component in the entire process of absorbing and using iron present in the body, copper helps keep the levels of heme (iron) up and regulates its flow in your blood vessels. ANTI-INFLAMMATORY PROPERTIES - Water stored in copper bottles helps in arthritis and other inflammatory pains. This property is especially great to relieve aches and pains caused due to inflamed joints. In addition to that, copper also has bone and immune system strengthening properties, making it the perfect remedy for arthritis and rheumatoid arthritis. 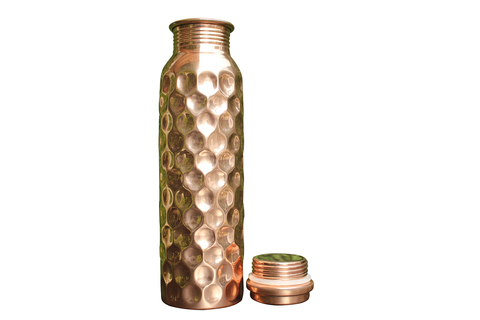 100% PURE COPPER and DURABLE JOINT FREE DESIGN - Most copper bottles sold in the market are coated with copper and will not give therapeutic properties to water. A joint free or seamless design guarantees the durability of the copper bottle and can last a lifetime. 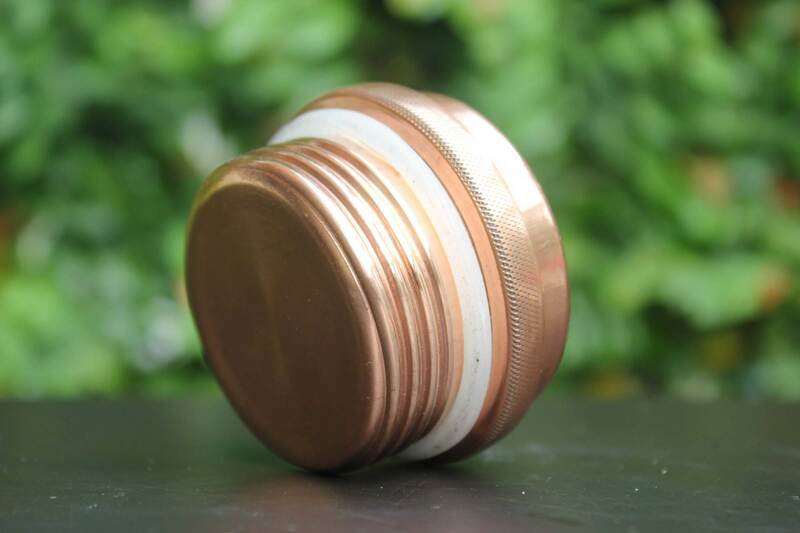 LONG LASTING and LEAK PROOF - New and improved cap is made to be screwed on and is provided with a silicone washer, which is food-safe, to give you a long-lasting and leak proof use. It is water tight with a seal that keeps the water out even when the bottle is upside down. Excellent for travel use. BEAUTIFUL HAMMERED DESIGN - Handcrafted by skilled artisans using traditional techniques. Rinse your new copper bottle thoroughly with water. Then fill it with water and cover it. Let the water rest for 6 hours (minimum) to 8 hours (maximum) and then drink it. For best effects, Keep water in a copper bottle overnight by your bedside and drink this water first thing in the morning when you wake up. This particular practice is very useful in stimulating your bowel movements in the morning. This practice will keep your digestive system very healthy and set your metabolism for rest of the day. You will feel very refreshed and light every day. To clean the outside of the bottle - Take some salt in a bowl, cut a lemon in half and dip it into salt. Rub this lemon over the exterior of the copper bottle. While doing this, gently squeeze the lemon so that lemon juice mixes with salt. Here, salt will also act as a scrubber. Repeat this process until you cover the copper bottle completely. Once you are done, rinse with water and wash thoroughly. To clean the inside of the bottle - Squeeze half a lemon into the bottle, and add 1 tablespoon of salt and 1/2 a cup of water in it. Close the lid and shake the mixture thoroughly just like you shake your protein shake! Pour this mixture out and rinse the bottle with water.